The magnetoresistance effect is the tendency of a material to change the value of its electrical resistance in an externally-applied magnetic field. It has been widely applied in sensors and hard disk heads. So far, no link has been established between the existing magnetoresistance and spin texture of spin-polarised materials. Researchers from the National University of Singapore (NUS) have recently made a breakthrough in this field, revealing a close relation between the spin texture of topological surface states (TSS) and a new kind of magnetoresistance. This fundamental advancement is achieved in collaboration with researchers from the University of Missouri, United States. The research team observed for the first time a novel magnetoresistance in three-dimensional (3-D) topological insulators (TIs), which scales linearly with both the applied electric and magnetic fields, and shows a close link to the in-plane and out-of-plane spin textures of TSS. The team's finding could help in addressing the issue of spin current source selection often faced in the development of spintronic devices. The research team, led by Associate Professor Yang Hyunsoo from the Department of Electrical and Computer Engineering at the NUS Faculty of Engineering, published their findings in the journal Nature Physics. The discovery of 3-D TIs has generated great interest among international researchers, who now seek to understand the physical properties of this new state of matter and explore its applications in optoelectronics and spintronics. So far, the magnetoresistance found in 3-D TIs is current-independent, reflecting a linear response of the electron transport to an applied electric field. At the same time, a transport obstacle exists in detecting the surface properties, due to the significant bulk contribution, which overwhelms the surface responses. "In this work, we observed the second order nonlinear magnetoresistance in a prototypical 3-D TI Bi2Se3 films, and showed that it is sensitive to TSS. In contrast with conventional magnetoresistance, this new magnetoresistance shows a linear dependence on both the applied electric and magnetic fields," said Dr. He Pan, who is the first author of the study and a Research Fellow at the Department. Assoc Prof Yang added, "Theoretical calculations by our collaborators from the University of Missouri revealed that the bilinear magnetoelectric resistance originates from the spin-momentum locked TSS with hexagonal warping. From the perspective of the microscopic origin, it is a fundamentally new process regarding the conversion of a nonlinear spin current into a charge current under the external magnetic field." Probing the surface spin texture is of critical importance for the development of TI-based spintronic devices. However, the approach performed to date is highly restricted to sophisticated tools such as photoemission spectroscopy. 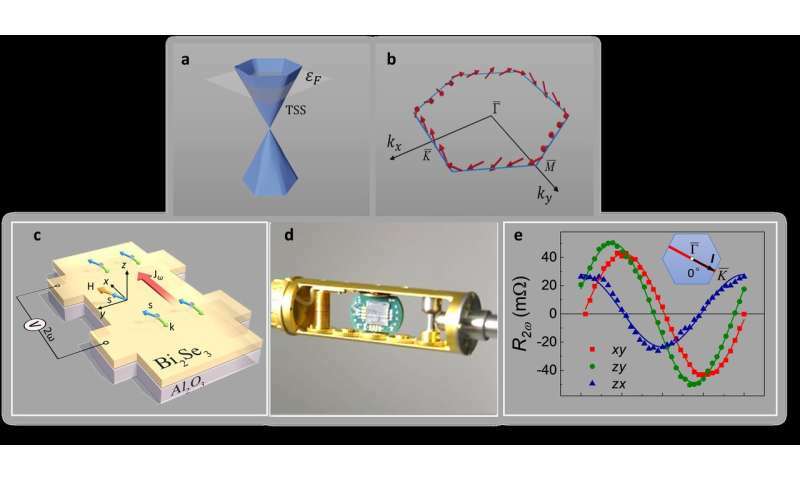 The novel magnetoelectric resistance observed by the research team provides a new route to detect the 3-D spin texture in TSS by a simple electric transport measurement without involving any additional ferromagnetic layers. The team's study also revealed the hexagonal warping effect in TSS, which could previously only be determined by photoemission spectroscopy. Commenting on the significance of the breakthrough, Dr. He Pan said, "Our results can be applied to extended families of highly spin-polarised materials, like Rashba/Dresselhaus systems as well as two-dimensional transition metal dichalcogenides with spin-polarised states. It also provides a new route to detect the 3-D spin texture of these materials by a simple transport measurement." Moving forward, Assoc Prof Yang and his team are conducting experiments to increase the magnitude of the novel magnetoresistance by refining the TI materials and film thickness. They are also planning to incorporate and test the technology in different materials. The team hopes to work with industry partners to explore various applications with the novel magnetoresistance. The origin of linear magnetoresistance—exotic or classical?